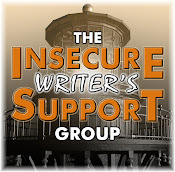 Posts for the Insecure Writer’s Support Group were awesome this week! I so wish I could visit everyone, but the group is three hundred plus strong now. Even with clones, I can’t manage to visit everyone. Special thanks to Misha Gericke and Joylene Nowell Butler for their help as co-hosts. The IWSG is on for April during the Challenge! If you can’t post, that’s fine. But we’ve never missed a month and some members aren’t participating in the Challenge. So April 3 is our next post date. Co-hosts! I still have a list of volunteers to co-host, but I want to throw April open. I know it will be busy with the A to Z Challenge. If you can help co-host next month, please let me know. It involves visiting twenty to twenty-five blogs and I need two helpers. If you can do that, just leave a comment. Thanks! Thanks to those who responded to my IWSG insecurity. (This comment in particular made me laugh: “I think you could post the phone book and you'd still get 1000 comments.” - Maurice Mitchell) From now on, more Ninja as requested! However, I will continue with the Ninja News and with announcements. Just smaller. I want to extend a special thanks to four special ladies. 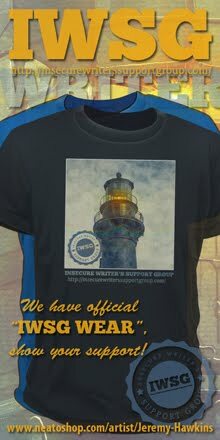 Many of you have been with the IWSG for a long time, only missing a post or two. Four bloggers have posted with diligence since the very first month, September 2011, and not missed a beat – Marta Szemik, L. Diane Wolfe, Christine Danek, and Siv Ottem. Thank you for your dedication, ladies – you rock! My small thing this week for VikLit’s “Celebrating the Small Things” is definitely the IWSG! The winners of Misha Gericke’s Paying it Forward Awards for February were announced this week. I won Best Commenter and Most Supportive/Helpful Blogger – whoa!! Thanks to everyone who voted. Check out the other winners, as they rock as well. 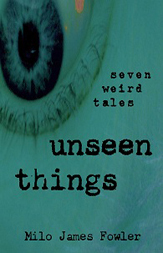 Milo James Fowler’s Unseen Things, a collection of seven weird tales, launches today. Congratulations, Milo! Sandra Almazan’s Twinned Universes, Book Two of the Catalyst Chronicles series, is now available as an eBook! Print book to follow. Congratulations, Sandra! Jess McKendry’s book launches today – as does her blogfest - From The Ashes. Congratulations, Jess! And does anyone notice something new about my blog header...? Free Books on Amazon – Good or Bad? Some authors and publishers offer select books for free on Amazon. Is this a good or bad thing? I’ve heard some say it devalues the work. (I can certainly understand that since I know how much effort goes into writing a book.) And that a high ranking due to free downloads doesn’t mean anything and can lead to a lot of bad reviews. I’ve heard the opposing view that offering one book for free entices readers to buy other books by the author, thus spurring sales. I can understand that as well. And there are all sorts of things to consider in between – authors with only one book, allowing only Amazon to offer the book, etc. So what do you guys think? Is free good or bad? Or does it depend? Did you enjoy Wednesday’s IWSG posts? Can you co-host next month? Excited about the new books? Think Mini-Alex should get out more? Think free books on Amazon is a good or bad thing? And anyone else going to see Oz tonight? I agree that you could post the phone book and still get a load of comments. You're just that awesome! IWSG is always great. I look forward to it every month. I have mixed feelings about free Amazon books. I have done free promos for my books, but I'm not sure it really does inspire people to buy other books. Lots of people just want freebies! I hope the free book thing is short-lived. I don't think it helps that much, as many will simply 'buy' the free book and never even read it. I know I have about twenty on my Kindle and I haven't read them yet. I wouldn't mind trying some of them, but I have too many books of known quality that I feel more compelled to read. The whole ebook explosion is so new that nobody really knows what works. I'm loathe to put my books up for free because I do feel it devalues them. Sales don't seem to garner much increased traffic either. I think the best thing to do is to keep on writing, keep a high profile, and be in it for the long haul. I enjoy reading the IWSG although I don't participate in it. WTG winner and the new books look awesome. Mini Alex definitely needs to get out more. Free books are a double edged sword. It's both good and bad. I enrolled my latest book in the Select thing, but I probably won't offer it for free. I think some readers are starting to expect they'll never have to pay for a book again, which is obviously bad for the industry! I love that T-shirt, I'm determined to buy it soon! I can volunteer to be a co-host next month - I'm not doing A-Z so I'll have a bit more free time than other people. Hi Alex - as Elizabeth says the header rocks ... great change ... and I love Elise's mini Alex - and now he's got a maxi T-shirt ... lucky chap!! Retro-Zombie Jeremy has loads of creative talent .. but Elise takes the guitar just now! Love the t shirt, Enjoyed the group on Wednesday made some new friends. Have sent email hope it and this gets to you. yesterday, great movie to quote from, emperors new groove was underrated! and i know what you mean about books coming out and us plugging them. i like when friends or the author does more than the facts, like advice or an interview or something. today, i think free books can be good if not overdone. when i get pubbed, i am afraid of the rankings and sales numbers, afraid i will look too often even tho i dont want to.... guess i will save that for another iwsg post! I will absolutely not see Oz. My kids are in agreement. Enough already. The original was perfect...and we don't need those flying monkeys to look any scarier. Your header is AWESOMESAUCE. That is all. I have both my books for free at Smashwords this week for a site wide promotion there, but I never took up the offer at Amazon to be with them solely for any length of time or have my books listed for free. Love the header. I think it's an individual choice whether to offer your book for free or not. If an author thinks it'll help with other books or some other way, they should be able to do it. It's just like giveaways can help create buzz for a book. I think it depends on the readers. Ultimately that's what it always depends on- but word of mouth is still one of the best forms of marketing and free gets into the hands of people faster. I just see a black bar where your header is. I try using my iPad to check blogs and this is what happens... I did a free promo for War Angel and once the sale was over that story continued to sell way more than A Dead God's Wrath ever has by a huge margin. 3 times more at least. I have one short story in the Select program and used some of my promotional days last month. Giveaways were relatively modest, but I did get on a couple of bestseller lists and garner some reviews. I didn't see much effect afterwards, though. I'm also offering a short story perma-free on Smashwords and B&N; so far, Amazon still hasn't matched the price. That may have led to one sale, but again not much help. Perhaps it's because I'm giving away short stories when people want whole-length books. I do know from my own experience as a reader that giving away the first book in a series can make me want to read the entire series. But maybe the easy days of gaming the sales are over and we have to let our books find their readers gradually. I'm undecided about the whole free book thing. Part of me jsut wants people to read the books, but another part wants to justify the years spent writing it. I'm not a huge fan of free books. As a reader, if I know the author/publisher tends to set a book free right before/after the next one comes out, I will rarely spend money on it, preferring to wait until it is free. Sad but true! And while I know many set their first book in a series free hoping it will encourage people to spend money on the rest of the series ... that first book has to be really, really spectacular for that to work for me. And as a writer/publisher, I do feel that free books can lower public opinion of our work. There tends to be a general sense of "Well, a really good writer wouldn't need to stoop to free books," and while I've gotten some wonderful books free, it is hard to fight against that general opinion. As for Oz - I probably won't see it in the theater, but I am curious! I love, love, love the books and am fairly indifferent toward the original movie, so I'm mostly eager to see what ways they went back to the books, and what ways they tried to stay close to the original movie. Your blog header is moving!!! WOW!!!! Awwww mini-Alex!!!! No need for fashion! Just go naked. And lose the guitar. I love reading the IWSG posts! Mini-Alex should get a chance to explore more. I have mixed feelings about free books. I'm not sure it really leads to more sales. Ted, that's true you'll feel more compelled to read it if you've shelled out some cash for it. Elizabeth, having more than one book makes sense. Annalisa, there is a danger in that. And thank you for volunteering! Hilary, they both did a great job. Tara, rankings aren't too scary. Tonja, since it's a prequel, I'll give it a shot. Rusty, that's great it did so well! And yeah, with an iPad the header blacks out now and then. Sandra, I've heard the advantage of free is slowly going away since so many are doing it. And you're welcome! Justify the years spent writing it - well put, Melanie. Louise, good points! And you know, I never liked the Wizard of Oz either. Lisa, that's interesting about the free chapter at the end of the book! I'm not at all bothered by a free Amazon book. It's up to the author/publisher. People can choose to buy it or not. To each his own. P.S. I LOVE that t-shirt!! There's another Oz? I'm so out of the loop. I keep going back and forth about the free books but I think there's such a glut of free at this point, readers have come to expect it and don't want to pay. It's sad when one compares the price to a bottle of soda and doesn't see the worth of our words. Offering the first of a series for free might be worth the risk but again, I think it only works for some. I like the format Alex. I can help Annalisa next month; I'm not participating in A-Z either. Kill Zone had a great post about free ebooks a couple of weeks ago. Their authors very much encouraged the technique of free but recommended using it very strategically. Was a good post. Glad to hear there'll be more ninja thrown into the recipe, there Alex! And it's cool to hear about people who've been with IWSG since the beginning. Had I blogged in 2011 (or had I even been aware that blogging existed) I would have followed ya, too! And thanks for your words this week :)Yes--we do have something to work on--and I feel a bit more energized about doing so after the feedback I recieved over at EPWN. :) The IWSG is SUCH a great thing!! Unseen Things sounds like a very interesting book! I will check it out for sure. I do plan on seeing Oz either this weekend or next. Like Kyra mentioned, I also have mixed feelings about freebies. I confess I downloaded a few, and didn't read most. Take poor Mini-Alex out now and then. The Amazon exclusitivity thing is scary. Never place all of your eggs in one basket. What happens if they become the only game in town? Authors, publishers, and readers will all lose. That blog header is ALIVE! 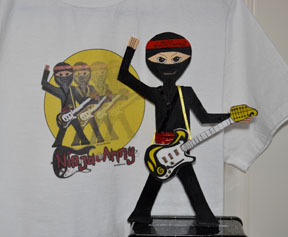 It's moving, pulsing, flashing Ninja energy---ZAP--into the blogosphere!! Free Amazon books? It has it's pros and cons, I suppose! As for free books, I think they can serve a short-term marketing goal, especially if it's the first book in a series and the next book(s) is coming out. But that only helps if the people downloading the freebie actually read it and then are willing to buy the next book. I am so inspired by IWSG that I would be honored to volunteer next month, Alex. I've only been around three months so I'm not sure I qualify but I'm more than happy to help. I think freebies should be up to the author since it's the author's work that's up for sale and critique. Maybe they can limit the length of time the book free? If a book is being offered for free it tell me that it's not selling well which tells me maybe there's a reason for it not selling so well which would not lead me to 'purchase' said free book (not that I could anyway since I don't have an e-reader). So my answer is, no, bad idea. Authors may write books because they love to write but they also do it in the hopes of making a living doing what they love and free books don't help - imo. the header is rockin'! I'm definitely digging it! I love the IWSG and have found many helpful "friends" because of it. I'd love to co-host sometime! I'm sure tons of people would-- but if you need a spot filled- I'm your girl! We are taking the kids to see Oz tomorrow... my 5 year old loves all things Oz so-- it's a no-brainer. Not to mention, the China Girl is voiced by the same little girl that plays Ramona-- kids and the things they love! I'm not crazy about free-books on Amazon... and, it's mostly for the reason you mentioned- the sheer number of negative reviews is daunting! Books before Copyrights was born... I have seen 100's of digitized books on Amazon for a couple of bucks for books that they didn't write. I am one to use the art in my designs, because it is BC [Before Copyrights]... there are so many great books and now there are people giving away their works to get noticed, just to get noticed. I want to give my book away, not to get noticed.. but so I am not forgotten and to final share the crazy book. Mini-Alex and shirt are Awesome! Ps. I think there is a flashing ship approaching. Several indie authors have hooked me on their series by offering the first one free. So, I think it is good and a great marketing tool, but you have to have to have the second book ready for purchase. I agree, you could post the phone book. Never seen anyone get as many comments as you do. Not being a writer I don't read the ISWG posts but I think its a great idea. As a reader I love free books, I read things I probably wouldn't have bought and then frequently buy the sequels. Mini-Alex's t-shirt is awesome. And so is the new moving header! Kitty, he would be scary naked! Liz, you should get one. Laura, there are a lot of free books out there. Julie, thank you! And I'll have to read that post. Randi, glad the IWSG has helped you! Donna, that is the key, isn't it? Elsie, I just might need three co-hosts, so thank you! Azia, thank you! Appreciate the offer. Jeremy, you would know about that ship! Mina, all depends on which side you're on, right? I'll be on modified blog hiatus for most of April and possibly May, but I plan on doing IWSG. I'd be glad to help. Re: free ebooks. I have mixed feelings. I don't think there's anything wrong with a short free promotion. I wouldn't leave a book at that price, though. I DO like it when authors price one of their books, such as the first in a series, lower than the others to entice readers to give their writing a try. I usually pass on an unknown if all their ebooks are greater than about $5, even if the story sounds good. I gladly buy small pub and self-published books, but I'm a picky reader and I've been burned too many times to waste my money anymore. I love the IWSG! Thanks again for starting it. I think a reasonable number of free ebook downloads given is wise to get word of mouth going about your book. Even traditional publishers do this and always have. Track them, though, and see if you notice sales or reviews coming in. Not going to see Oz. John Locke has a great Amazon marketing plan. It does include free books. He makes mention that if you have a lot of books out, if you offer one free (not constantly free) you can "hook" the readers. I find it to be true. I found Elizabeth Naughton via free book. I was scrolling through PNR on Amazon, read the description and grabbed the free copy of the first in her series. I think there were about five out total. Several months later I read it then proceeded to buy ALL of them at full price (ebook) after I read the first one. While I think free books have merit, I do believe they are overused sometimes. But part of a smart marketing plan, I think free books on a limited basis are very helpful! Have fun at the movies. I'm excited to see OZ. Hope it's as good as it looks on the previews. I found this months IWSG very encouraging and helpful. Thank you very much. I probably won't see Oz this weekend, but maybe next Tuesday. When an author I know offers a free book through their website or blog, I usually take it and read it. I've read some great stuff that way and a lot of it outside my normal genre of choice. But trolling the 'sites' for free books,just seems wrong. The whole idea of free books is definitely a double edged sword for all parties involved. I think mini Alex should definitely get out more. Not sure about free books - mixed feelings there. Sorry I can't help with co-hosting duties. I am so overwhelmed right now. Have fun at the show tonight. As for free books, I think it depends. Right now, I have two free books out there. The one is on my blog, so I can't see charging for it when people can just read it for free as it is. The other is the first of a two-book series, and it has helped spur interest in book two. For me, right now it's worth it. Would I do it on all my books? Probably not. But having one loss leader can be helpful. As I said, it just depends. Your header is flashing! Ha! Oh, Blogger! Ate my comment. Blah. Anyway, I don't like free e-books. I think it contributes to a shifting perspective that views books as things of little worth. And I think that's bad for authors. Sigh. Mini Alex rocks...that is all! Melissa, thanks! And a lower price for the first book is a good idea. Jeff, I've only hit three hundred in one day once! Lynn, she obviously hooked you then! Cherie, stores offer loss leaders, so it makes sense. LG, and it takes a lot of effort to write a book! Sorry your comment was eaten. I'm hesitant to offer to co-host April IWSG because I'm your loyal minion for A to Z but if you don't get any takers let me know and I would be happy to help. As for the Amazon question it's a tough one. For your series, for example, it might help to get people hooked on book one and two to get more sales for three by lowering the prices or offering a free day to pick one up. I like free books just as much as the next guy and if the book is awesome I'm going to buy other books from that author. Great job on your awards! You deserve them. Congrats on the success of ISWG! I think one of the personality traits of all authors is that we have some serious insecurities. We're strange creatures like that. Yes, I think the free books are good and bad at the same time. IWSG is always awesome! Your header is really cool, and just keeps getting better - rotating colors now! Mini-Alex needs to take some vacations with big Alex and Mrs. Alex. Free books on Amazon - I have been hooked into series by authors I didn't know with the offer of a first book free. This really worked on me when the link for purchasing the second or third book was embedded in the end of the first. How often did I buy that second book? 4 out of 5 times. So, free first book when the second is already out = winner. Otherwise, I don't think it really works. I wish I could see Oz or Jack this weekend - but I'm not sure. We're at the tail end of the ski season which means makeup lessons + ski and snowboard school parties. Plus I'm still snuffling and snorting with a cold - not pleasant for movies or skiing. I used to do free books but I stopped when several readers told me that they were waiting for my next free book since that was the only time they read me. Your new header is awesome. And I'm glad ISWG is happening in April, A-Z challenge or no. I see nothing wrong with free books. If it's a bad book at least you didn't have to pay for it. Happy IWSG did you good Alex and love the new header. All action. And the little guy has a cool T-Shirt. I've done several freebies and gone up in the ranks, just to plummet back down again. It hasn't really increased sales afterward, either. Oh well. The thing to do is to just keep putting out the books, I guess. So your blog header - you added the yellow, right? I think free books are good for everyone. I haven't had to pay for a bunch of my books that I'm reading because I've gotten them for free! So yeah, I'm a huge supporter of free books. I think all authors should give away free stuff (as much as possible). That comment by Maurice is so true. Thanks btw for asking after my health via twitter. I'm slowly but surely getting better every day. I should be 100% by next week. I also got my theme for April's A to Z. I'm going to blog about the Cartoon Network's "Clone Wars" and talk about all the stuff I like about the five season series. Free books on Amazon got my e-book, Neverlove, a bit of exposure it may not have had otherwise. As a new author, building from the ground up is key. Some things are trial and error, give and take...though there may be a whole lot more giving for the first part...a lot more lol! Not sure if I'm going to see Oz. Haven't been to the movies with my Chipmunk in a while. Would be good to take that extra Mom and Daughter time. I still feel a bit odd that I won't be participating in the A to Z challenge since that was the spark for the flames that became Neverlove. But I've got so much writing to do and promoting for Frailties that I'm surprised I haven't turned inside out and frightened the world with a lack of sanity. It must be holding on by a thread. And I stared at your blogger header. Maybe too long and I must have missed what is different lol!! -Yay for IWSG it seems like an awesome group to be a part of. -Free books... I think if you have several books out, its a nice idea to get more readers interested in buying ALL of your books, otherwise... I probably wouldn't do it. Ask me again after I publish, out of desperation I just might give in! Ilima, very glad you joined us! Sarah, I think I am covered, but I might enlist a few more co-hosts - thanks! Heather, believe me, I will keep you busy as a Ninja Minion. And my publisher has already stated they will never participate in the free book program on Amazon. Tyrean, first WE need to take some vacations!! Gwen, Jeremy added one of the ships from the third book's cover - now the header is complete! Angela, we will miss your posts during the Challenge this year, but I'll still visit! I think free promotions are fine. I think permanent free and permanent $1 are bad. Bad for authors. Bad for books. If we're willing to shell out $10 for a 2 hour movie, why do so many people complain about $3 for a book that they get to keep? We're just training people to believe that authors shouldn't really get paid to entertain them. As far as I'm concerned my $.99 Amazon story, "Horse Power," is a loss leader. It's a sequel to two other books, "Homecoming" and "Tourist Trap" and a lead-in to an upcoming trilogy. It includes brief summaries of the two previous books to put it in context, as well as the first few paragraphs of the trilogy. It'll be free March 16-18,and probably again later. It's always great to see Mini-Alex! Very eye catching header! I'm going to see Oz next weekend with my mom and kids for my mother's birthday :) I'm certain ice cream will be part of the afternoon too. Hmm...free books...I've read and enjoyed some free books and wrote reviews on them but have never purchased another book from the author. I've read some free books and have gone on to buy books. I've also downloaded free books and never touched them or only read the first sentence and passed on it. So there you have it- is it good or bad? Not really sure. I think it does, however, skew the ranking system and in some ways make it invalid. I personally prefer giveaways because most people who sign up for them are actually interested in the book and are more likely to read and review....but who knows..? Hmm... supposed to have a huge snow storm this weekend- a movie might be a great idea! Might have to see Oz. Looks good. Congrats to the all authors with the new releases! Love the Unseen Things cover! Your little ninja is so cute!! The free book...the free book. Hmm...personally, I think it's GENIUS if you have a series. If you can hook them with that first free book, then it's definitely a good idea. I've heard it both ways--some authors say giving free a day or two really boosts their sales on other books. I guess it really just depends on the author's work and whether or not it's appropriate. I didn't think letting Amazon have an exclusive was a good idea until I took a webinar and saw the stats. I'm giving Select a try with two of my books, but I'm not offering them for free until I do a promotion. Then I'll let them go for 0 over a weekend. Loved all of the IWSG posts this month. I still have some blogs to visit. I did enjoy this week's IWSG posts. Ruth Cardello achieved enormous success by setting her first book for free, then having the 2nd in the series for a price. So much success that she turned down a 7 figure offer from a publisher. I think the free ebook has worked with varying levels of success, but I don't think it devalues the work itself. A good read is a good read. Alex, as a reader, I love free books. My Kindle is loaded with mysteries, thanks to the authors who used KDP Select to promote their books. As a writer, though, I'd rather price my e-books in a way to keep them available on both amazon and Barnes and Noble. The hardcovers (or paperbacks) are the ones I want to give away, usually through my blog. I think it's a very personal decision authors should make based on their own needs, whether a print version of their book even exists, etc. I've heard some authors say that the free book promos help their other books sell, but then again I've also heard other authors say that the free books didn't seem to help much. I think there are a lot of different factors to consider, such as; genre, price of books, if people are just looking for free books, how many books the author has published, how much promotion work is done to get author's name out to the masses, etc, etc. I'm not a published author, so all I can go by is what I've observed or heard from other people. I love the new blog header. As a reader, I tend not to download free books. It's the old ingrained "you get what you pay for". I have trouble getting past the feeling if it's free, it's not worth my time. Andrew, excellent analogy! Especially as I'm leaving soon to shell out ten bucks for a movie. Sue, several others have said the same thing about the first book in a series. Tina, that would be awesome if you got a shirt! Make Jeremy very happy. And yes, there is an extra ship in the header now, thanks to Jeremy. Birgit, that's how a lot of people buy books. Rebecca you're right that with giveaways it's someone who really wants your book. Congrats on the winners. I don't do NaNo, so I'm free next month if you need me. I could also visit more blogs too. I love doing this stuff. Some of those posts made me cry. Gawds, we've got some talent around here. I agree. I'd read the 1000 names from the phone book and revel over them. Sorry I'm late to the party today! The header is fabulous and I agree IWSG was great this month. Would love to see more of little Alex, he rocks! That's exciting news that IWSG has 300 members! I think offering a book for free on Amazon as a special promotion is okay, but I wouldn't have it permanently free. I truly enjoy the IWSG. I've only been part of it for a short while, but am having a wonderful time. Blog hopping on 300+ blogs isn't quite happening for me either. I do what I can, and trust it is enough. If an author only has 1 book it's of no use to go free since Amazon made their adjustments. It works well if you have a sequels. I know I just did this and it lead to a good amount of sales for the sequel. However, if you do this too frequently it doesn't work as well. You also need to advertise the free book otherwise you won't get that many downloads. As for bad reviews, yes that can happen, but I think the more people that read your book the higher the chance of a bad review anyway. I have a couple of close friends who've used the free strategy to entice lots and lots of readers. I'm hoping to do the same when I finally get my books out there! I can help in April for IWSG if you still need volunteers. I usually visit 20 IWSG blogs anyway. Congrats to all the authors and their new books! Woot! I'm not sure the Amazon only thing is good for any of us. I often worry we're trading in the Big 6 [now 3, I believe] for the Big One. I do offer one free book, and it does spur my sales in the series. For the new author, I don't begrudge anyone anyway they can gain a toehold. I love free book promos on Amazon. I'm reading two excellent freebies now. And I plan to do another free event for a short story soon. I would like to see some sort of free sample with Amazon books, if that's possible. Some books I've read include a bonus first chapter of the author's upcoming release. Don't know how that would work with e-books, but I'd hate to see authors give away their hard work just for a little name recognition and inflated ratings. I've missed the IWSG as I can't commit to a set schedule at this time. But it's a great community with hundreds of supportive writers, and the work you've put into it is certainly appreciated. Congrats to Milo, Sandra, and Jess on their new book releases! Joylene, the posts were incredible. And you guys are really challenging me on this phone book thing. MJ, glad you are a part of it now. Cindy, that is very true! I found that out back when my first book hit the best seller chart. But it's all good. Mary, you also have many shorter books you use to entice, which is cool. Thanks, Chris - appreciate that! I think having one book free for a short time may entice readers. But that's just my opinion. Congrats on two Paying it Forward awards! That's awesome! I'll probably stick with IWSG in April. I love free Amazon books, but I'm not sure if they entice me to buy more from the author since there are so many books out there. The writing would have to be spectacular for me to buy another title. I think authors should charge at least $1.00. But if you don't have a publisher and you are writing a trilogy or something, then yes, I can understand why the first one could be free. When I find an author I like, I buy all the other books they write. I think the whole free loss leader book-thing depends on the genre and those readers the author is targeting. For some readers, these 1st-book freebies work really well to introduce readers to authors they would never have discovered and gets them reading their paid books. For some readers, it could be a tacky way for an author to promote him/herself. You've got to know your audience and do accordingly. The multitude of comments on IWSG is something to celebrate! Congrats on your awards. And I agree that a new writer offering free books through Amazon's service is not worth it. You'd have to have a heck of a lot of downloads to have it make even a mark in your rise of rank, and then you are limited with only distributing through them for 3 months. If it was a guarantee you'd get a lot of honest reviews, it might be worth it. Otherwise, there're other ways to give away your book for free without that tether, i.e., Smashwords, LibraryThing and even Goodreads. I think it depends. If the author believes it could help sales, then that's their decision. And some people would probably say any downloads are better than no downloads. Ah, my illustrious human friend, your wait is over. For yes, it's me, Penny the Jack Russell dog and modest internet superstar! That IWSG thinga ma jiggy was good to go and check out. And noting two of my more adoring of human fans, Misha and Joylene, was really nice to see. And yes, you are one of those who could post up a photo of a cereal box and get more comments than I could or my human ever could dream of. At least you are, we believe, worthy of so much interaction. No, I wont go on a cynical rant as to why some sites that we think are garbage get so much response. Never do that. And to reiterate what my human mentioned. Despite your ongoing gestures of sharing so much info regarding others, we would like to see a bit more about yourself on your site. Just a thought and respect to you. I think that free books is a wonderful tool if 1) it is the first book in a series or 2) you have multiple books to offer. If you are just wanting to entice a reader to read your stuff, offering a free book often generates interest. If they like that book they will buy your other books. I am speaking as a book buyer. I tend to buy free books that spark my interest. If it is a series book, I often MUST BUY the rest of the series. So, I would say that the free book is a good hook. If it isn't a series, I do tend to remember well written books and fantastic authors. I am much more likely to buy their books in their future. So, I say YES to the free book. IWSG was fabulous. And such great new books out! Mini-Alex needs more adventures, even if just around the house. As for free books, I don't think it devalues them at all. I've read some amazing free ones. I also offer up free novellas. I do it to entice readers to buy my other books, and it does work. Mini-Alex should get out more. Can we see him with the entire band? I'm not sure what to think of free books. Some people say it has led to success in sales of other books, some say not so much. I have nothing against free e-books, though since the majority of my experiences with them were poor, they've gotten a little unfair stigma in my head that I'm still trying to weed out. I like the notion of having a series available in digital form and giving everyone the first book for free. No risk to try, buy more if you like it - it's a splendid model once you have a catalog. Love the new blog header. I never really thought about free Amazon books before. First thoughts - bad idea, devalues the book. But that's just off my head. Alex, I have to apologise for missing the IWSG this month. I fell into a bit of an energy downward spiral and my blog was a victim of that, with no posts for about two weeks. I'm now back on the blogging horse, but I did miss IWSG. I felt particularly bad when I checked my stats yesterday and found people had actually visited! It will not happen again! As for free books, it's a hard one. I have friends who are traditionally published and those who self publish. I have heard it said that the free promotions do increase the authors visibility, but recently, I've heard that is getting harder due to Amazon putting traditionally published books up for 20p. The authors of these books don't lose any money at this price, Amazon take the hit, but it's because they refuse to have their books at a higher cost than other ebook providers. With these big name authors at only 20p, I've now heard, it is this that is hurting the self published authors. Why would you take a risk on a self published author if you can get a traditionally published, previously read author for 20p? People rant about what Amazon do as though they have a responsibility to something. I don't see that they do. They set themselves up many eons ago as a business and this is what they are. But we have to fight in their ball pool. Love the new header! Very cool. I also love the IWSG posts. I missed it this month but am getting around today to catch up on reading. I think it has built an even stronger community. :-) I could co-host next month! Hi Alex, I love the IWSG posts. I can co-host next month, that is if you want me to as I am not participating in the A to Z challenge. Medeia, that's good to know. Nancy, there are other ways. Penny, I could post pictures of my favorite cereal! John, think that's the key - multiple books. Rebecca, no worries. And didn't know that about Amazon. Fantastic "Celebrating the Small Things"
I'm glad to know the INsecure Writer Wed is still ongoing. I always love to read the various posts but half the time forget to post my own! I should've saved my bad review post for the next day, it would have fit! Regarding freebies-- it is a mixed bag. It can certainly bring on poor reviews as those outside one's demographic download the book just because it's free. But it also helps to move the book up on those Amazon lists that give greater visibility long after the free days, and thus greater sales. WiDo uses KDP Select with its free days and its paid borrows to great success. So even though it does have its downside, I'd have to say a big Yes to the occasional free days when operated correctly. I'm still waiting for big and Mini-Alex to come to CA. I don't see a problem with giving away free ebooks. It's a good thing and a way to get your work out there. Congrats on the awards Alex, very well deserved. I really enjoyed reading ISWG posts this week, and used the twitter hashtag to find some different blogs, which was fun! Free books do entice me to buy other books by the same author if I like the writing. In addition, I try to review those books as a payback. Yes, Alex, I would like to see mini-Alex get about more. To the gym with you, to the seashore if you're near there, or to one of your guitar jams, he's got his guitar. Love the t-shirt design by Retro-Zombie. Elise created an icon for you. . .so take your little buddy out to see the sights. And take photos. Congratulations on your awards over at Misha's! I don't think setting a story for free necessarily devalues work. This is where my inner communist comes out -- I think knowledge should be free. As a writer, I'm more excited about hearing people say they enjoyed my story than I am about money from the story. The experience of telling a story and hearing a story is the valuable bit, not the dollars and cents. I have a short story collection which is free in an attempt to publicise my novels. Might not be seen as the best move but we have to do something to get the word out. There are plenty of pros and cons with freebies, but giving stuff away does work. As an author who tried it with only one book, I'd say it only really works when you have a backlist. Karen, operated correctly is the key. Robyn, if we do, I'll let you know! Laura, glad people are using the hashtag! DG, I'll take him out for a drive soon. Deniz, of course he would! Martin, I think the backlist is key. The Wednesday IWSG posts are one of my favorite all month! Unfortunately I'm not in any sort of shape to co-hosts yet. Sorry. Thanks for the shout-out, Alex! I regularly offer my short stories for free on Amazon, but I don't think I would do so with novels or novellas. Regarding reviews, my fewest stars tend to appear on Goodreads, not Amazon. Go figure! Love your new header, Alex! And congratulations on the Paying It Forward award. I'm careful about what I download on my Kindle account, just because I read on my iPad and you can't categorize the titles (yet - hopefully they'll add folders and such soon) and it's tough scrolling through a bunch of stuff. So even when a book is listed for free, I'll download the sample first, to make sure I want to read it. DL, you're a little busy with the Challenge! Rachel, offering a short one free makes sense. Belle, good point about the Kindle app. It is just one big, long scroll of books otherwise. I do like the IWSG posts. Congrats on your awards from Misha! I don't know how selling free books works for publishers or small presses. If it helps in the end, I can't say. I can say that I don't rush to pluck every single free book that comes along. My Kindle isn't that big! IWSG is wonderful and I'd love to see more of mini-Alex! I think free books are a bad idea. Too much blood, sweat, and tears go into those pages to give them away. I think the only problem with the free book promotion is that there are just too many writers and too many free books. I download them with good intentions of reading them and if I like them I will review them. But then another batch appears the next day and I get swamped. Days late, but I made it! I don't know if offering a book for free is good or not. I will say that I've downloaded free books. Most I'll likely never read. If I were that author, I would worry that readers who don't normally read my genre might hate it & post a less than stellar review. I've had that happen once. It's not a good feeling.